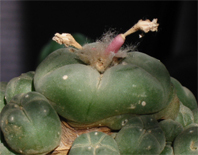 In the June 2008 issue of the Cactus & Co magazine Jaroslav Šnicer, Jaroslav Bohata, and Vojtěch Myšák described a new Lophophora species, Lophophora alberto-vojtechii, characterized by its small size, adult plants typically reaching just about 2 cm (less than one inch) in diameter. The stem is a greyish green with a touch of mauve (greenish, greenish grey to mauve), for the most part concealed in the ground. The aerial part (crown) is flat to slightly convex, 18 mm wide (10 to 50 mm in adult plants); the subterranean part of the stem is cylindrical, extending 25 mm down from the base of the crown (the depth in adult plants increases with age). The stem is distinctively small and divided into five ribs (up to eight ribs in exceptional cases). The trichomes are visible only near the apical meristem; they drop off early, leaving the areoles inconspicuous. 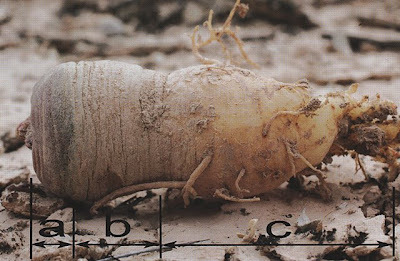 The root is thick and bulbous, 30 mm long and 16 mm in diameter where it joins the subterranean stem, smooth, and a dirty white to creamy yellow colour. 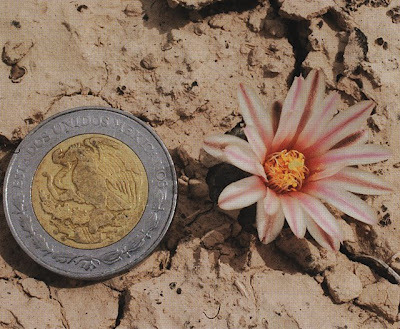 The flower is 23 mm wide (15 mm to 35 mm). The tepals and style are long, the same as in other members of the Diffusae section. The filaments are white, the anthers a yellowish orange. The style is white, while the stigma is yellowish (white to yellowish or pinkish). The tepals are light pink with a distinctive darker stripe (white to dirty pink, rarely creamy yellowish with a stripe in a brownish, salmon or darker pink shade) on the adaxial surface. The fruit is round to slightly claviform, and dries out over time. The fruit is a dirty white colour, ranging to yellowish or pinkish. The seed is black, round, 1.45 mm long (1.15 to 1.45 mm) and 1.45 mm wide (1.0 to 1.45 mm). The hilum is compressed into a broad V-shape. The perimeter of the hilum consists of a pronounced edge. The testa is nodulated with protruding outer cell walls. The individual cells of the testa are clearly demarcated. Type locality: northern San Luís Potosí, Mexico, 1700 metres above sea level. The type specimen was collected by G. B. Hinton on 1st August 2007 and is kept at the G. B. Hinton herbarium filed under number 28642. 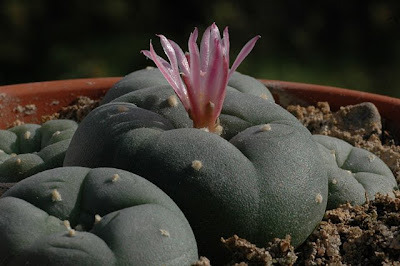 We are naming the plant alberto-vojtechii in honour of two persons, the late prominent Czech traveler and cactus-hunter Alberto Vojtěch Frič and the current Lophophora enthusiast Vojtěch Myšák. 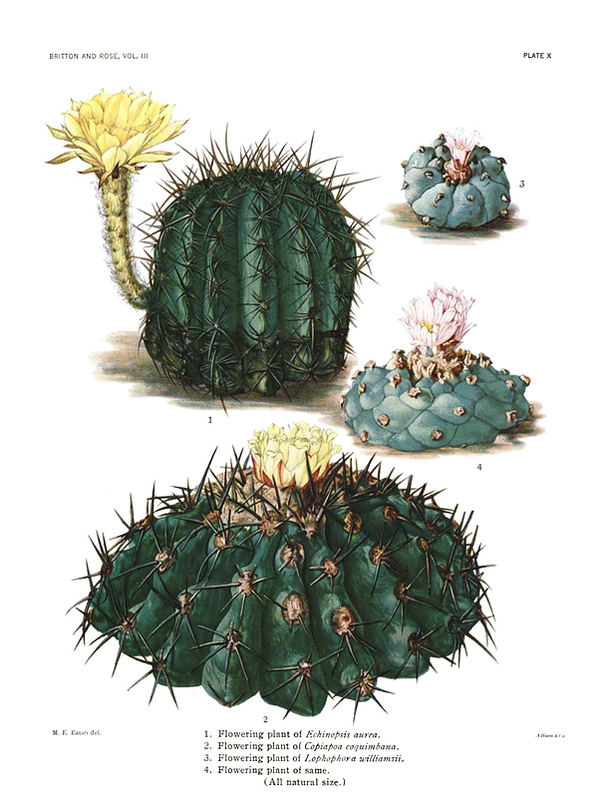 The authors place L. alberto-vojtechii within the section Diffusae (see the Kaktusy 2005, Lophophora Special) along with L. diffusa, L. fricii, and L. koehresii. Based on similarities in habitat (mud flats), growth form, body, fruit, and flower morphology, and loss of trichomes in older areoles, Šnicer et al. conclude that L. alberto-vojtechii is closest related to L. koehresii. However the two species differ in size, the color of the epidermis, seed morphology, and the number of ribs. Šnicer et al. 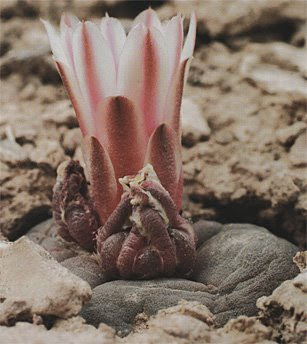 argue that even though the small Lophophora alberto-vojtechii plants might look immature at a first glance they are not, as is evident by old growth epidermis at the ground level and the subterranean part of the shoot. 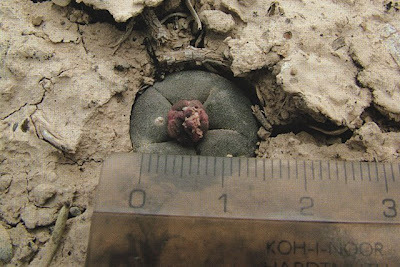 The habitat comprises flat, alluvial sediments, as in the case of Lophophora koehresii. 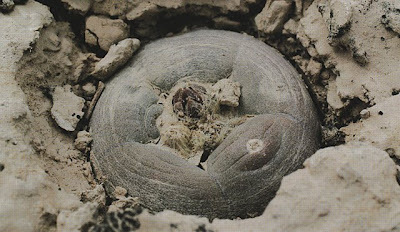 Lophophora alberto-vojtechii has a distinctively geophytic lifestyle, withdrawing into small cavities below ground during dry periods. Here the plants are covered with dust and dry leaves, protected from the sun until the next rains. 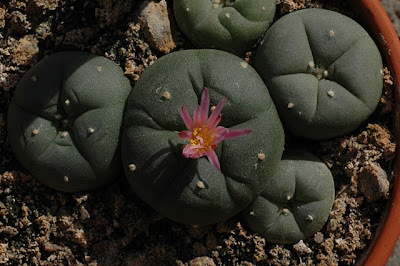 The type locality of Lophophora alberto-vojtechii is in the northern part of San Luís Potosí, but it has also been found growing in the states of Zacatecas and Coahuila. 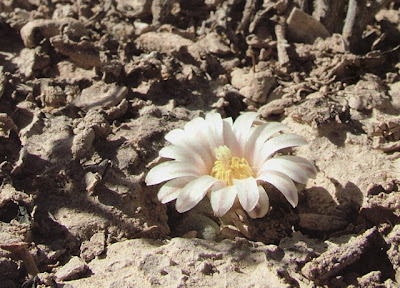 The flowers of the Zacatecas plants are more white than those of the plants at the type locality (see picture above). All in all the description is credible and well argued. Adding to the credibility is the fact that George Hinton collected the holotype and stores it in his herbarium, I doubt he would do that if he wasn’t convinced that this new taxon is for real. The flower buds are visible very early, as they are not hidden in the wool.